→What is Affiliate Marketing About and How Does It Work? There are many ways of making money online. Some people make a lot of money selling products or offering services. And then there are those who are earning thousands of dollars a month through affiliate marketing. Affiliate marketing is a form of marketing wherein the affiliate (you) can refer someone to a product or service, and when this person buys the product or service, you will be paid a commission by the company who sells the product or service. If you’re thinking of becoming an affiliate, there are a lot of online companies who offer affiliate programs. All you need to do is simply sign up for their program and you will be given a unique tracking link. Use this link to recommend the company’s site, and if your readers buy anything, then the company will give you a commission. Each affiliate program I’ve come across has a set of TOS. Some of them, for example, have a 60-day cookie period, which basically means that if your special link is used by a visitor to get to the site’s sales page and then, instead of buying now, he buys sometime within the next 60 days then you will still be given a commission. #1 Are there any risks? As with everything else, there are always risks. The best way to keep your risks low is by making sure you choose reputable affiliate programs offered by established companies. 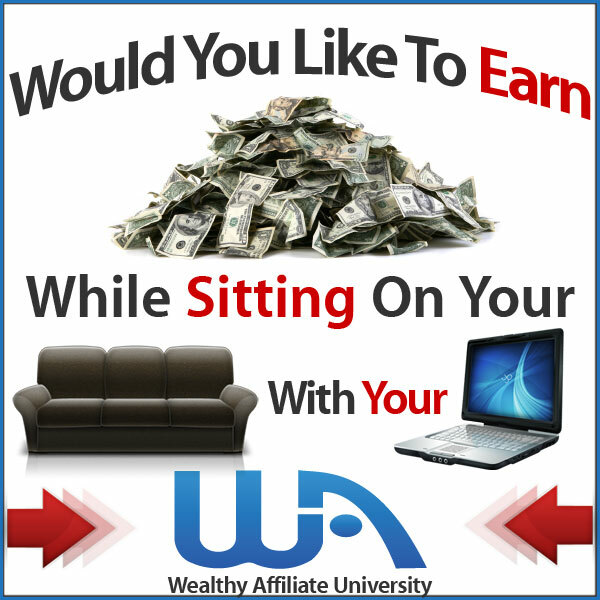 There are many options out there such as those offered by Wealthy Affiliate which has been existing since 2005 and has a community of more than 800,000 members. #2 Can I use Adsense and affiliate marketing on my blog? Absolutely. Using affiliate marketing does not break any Adsense rules. So if you’re not making enough from Adsense, you can supplement it with Affiliate Marketing. Better yet, you can switch to Affiliate marketing completely. #3 How do I find a product’s affiliate link? For companies that offer affiliate programs, all you need to do is check their website for information on how to get started with promoting their products. When searching, always see their FAQ page if they have one. #4 How will I know which products to promote? You can pick products related to your blog’s niche and then from there, do your research for each product – read up customer reviews, product descriptions etc. If the product is any good, you should be able to find at least a few positive reviews online. #5 Do I need a website or blog to be able to join affiliate marketing? Not necessarily. There are other ways to promote products such as through ebooks that you’ve written, through email marketing and even by simply leaving product links when you make comments in forums. But I believe that a blog is the most effective way to promote affiliate products. Besides, you can monetize your blog using other methods too including advertising and PPC. #6 How much do I need to pay to join an affiliate program? A quick search online will show you at least dozens of people who are now making 7 figures a year, like Mark Ling who started with affiliate marketing in 1999, Missy Ward, Shawn Collins and a whole lot more. #7 How much money can I make from it? There’s no limit to how much money you can make from joining such programs. But your success depends on several factors including the kind of products you’re promoting, your niche, how much traffic your website gets, how well your website converts, how well the sales pages of your affiliate products convert, etc. Some people make $50 a month through Affiliate Marketing but there are also those who make $5,000 a month or more. #8 How do I get started? Create a resource page: By putting together a page that contains all the information about the business’ tools and resources, you are creating something that others will find useful and share with their friends. Write product reviews: Before people buy products, they want to know about them first. The key is honesty. You want to win your readers’ trust and so by being honest, you’re doing exactly that. Create helpful tutorials: Tutorials are simply among the most effective strategies for getting affiliate sales. It’s not easy to make a tutorial, mind you, but once you’ve experienced the results, you’ll know they’re totally worth it. If you don’t know what a tutorial is, basically, you write a post that explains to people step by step how to accomplish something– and then you highlight a product or service (affiliate offer) within your tutorial. Make comparison posts: Here’s another good strategy for making affiliate sales. This is especially true if you’re comparing two products that are equally popular or in demand. For example, the iPhone 7 and the Samsung 7 Edge. Or the Xbox One and the Playstation 4. In the end, your success as an affiliate marketer really depends on your own dedication and consistency to working on your website and promoting it. It’s not a get-rich-quick method and anyone who thinks that is bound to fail. Affiliate marketing has proven again and again that it’s a solid platform for making money online. But whether or not it will work for you entirely depends on you. But if you put in efforts I’m sure you will make it. Click here see the proven success stories. Let me know your thought by leaving your comment below.